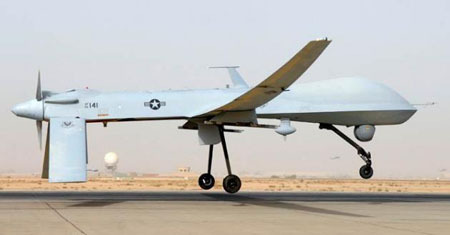 A TEARFUL United States attack drone stationed in Afghanistan said it was ‘elated’ today over the news of president Obama’s re-election victory. S-3476 said it stayed up all night to watch the live coverage of the ‘nail-biting’ voting count and expressed deep emotion throughout the event. It is expected that S-3476 and its fellow fleet of 500 drones are to withdraw from Afghanistan in the latter part of 2014 under the re-elected Obama administration. “I just can’t wait to retire to a nice military museum somewhere and just relax.” said one former array of recycled metal sheeting and household electrical appliances. In a wide-ranging victory speech, president Obama praised America’s attack drones in Afghanistan as the “best in the world” and pledged to bring his toys home safely over the next 24 months. He said: “Without the hard work and attention to job detail of our $11 billion drone programme – I would not be standing here today giving this victory speech.